The driver of a Florida day care van has been arrested in the death of a 3-year-old boy who earlier this week was left inside the vehicle on a hot day, Orlando police said Thursday. Deborah Denise St. Charles, 51, was taken into custody and faces a charge of aggravated manslaughter, police said. The boy, 3-year-old Myles Hill, was one of several children being driven between two day care centers Monday. The driver did not do a headcount and failed to remove Myles from the van, leaving him in the vehicle for nearly 12 hours, police said. "The suspect's failure to locate the [boy] in the vehicle prior to locking the doors placed him in grave danger and subjected him to temperatures between 100-144 degrees, which is the unbearable environment that caused his death," police said in an arrest warrant affidavit. The boy, who was about two weeks shy of his fourth birthday, was later discovered unresponsive inside the vehicle. St. Charles was being held at Orange County Jail Thursday night, a police spokesperson said. It was not clear if she had an attorney. If an autopsy confirms Myles died of heat, he would be the 32nd child to die in a hot vehicle this year across the United States and the fifth such fatality in Florida, according to NoHeatStroke.org. Myles was found in a van outside Little Miracles Academy in Orlando. His grandmother had called police to report that the day care center did not bring the toddler home, according to Orlando Police Chief John Mina. Police then found Hill in the van, the chief said. Police said the daycare worker admitted that a headcount of children had not been done. 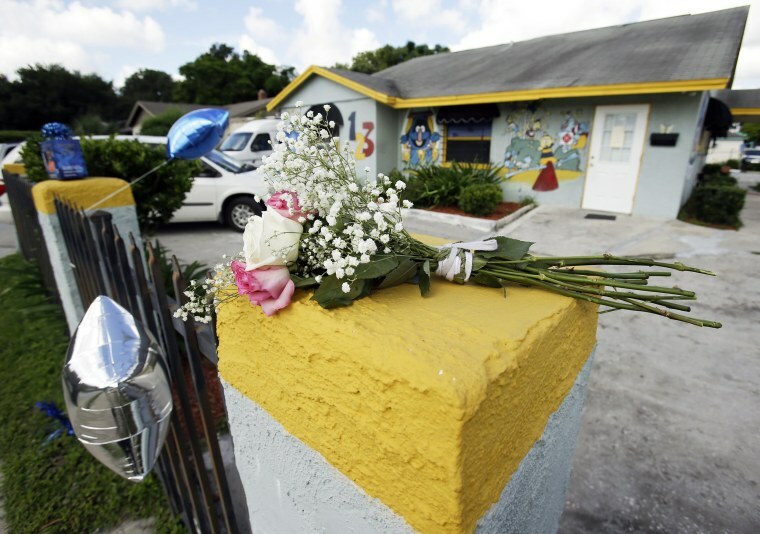 The Little Miracles day care center had passed an inspection by Florida's Department of Children and Families in July, officials said. But the facility was cited for "non-compliance" in one area: Its log for transporting children did not include required elements — such as destination and arrival times and locations, according to a report by the state agency. The deficiency was corrected at the time of the July 11 inspection, the report says. Little Miracles owner Audrey Thornton apologized in a tearful press conference Wednesday, according to NBC affiliate WESH of Orlando. "I'm so sorry," she said. "… I loved Myles and I took care of Myles since he was a baby. And if you all can forgive me — I'm so sorry."